Create DVD discs with personalized menus. Enhance them with titles, music and effects. Choose from a set of handy and professionally created presets Burn the project to DVD and share with friends and family. AVS DVD Authoring is an easy-to-use disc authoring and burning software that lets you do more with digital media. AVS DVD Authoring has been designed to help you organize your video footage into a professional and good-looking DVD project. ...... MKV, FLV (see a full list of Supported Formats here). HD Video (inc. AVCHD, MPEG-2 HD and WMV HD), TOD, MOD, M2TS. Edit high-definition files, create a DVD disc with superb video quality. Add background music. Position and resize titles and text. Make your video truly individual. Create DVD chapters for easy navigation. 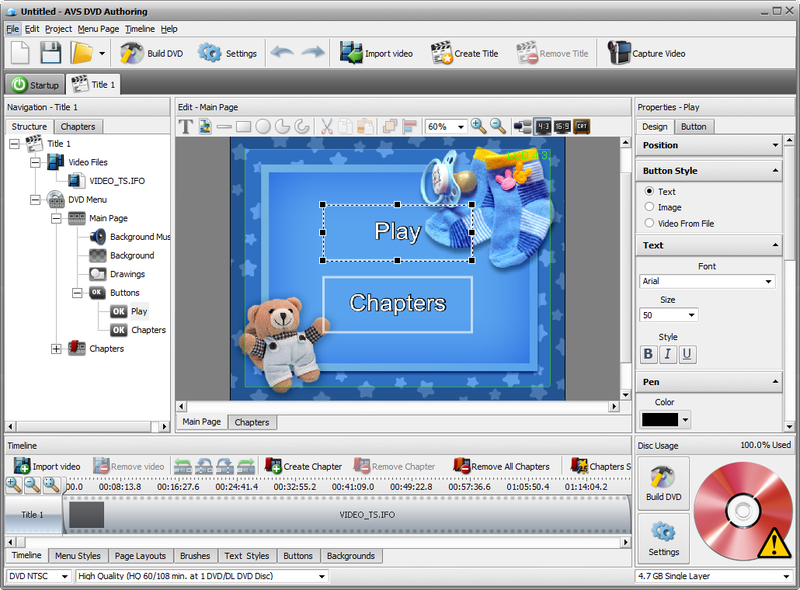 Edit chapters buttons and set background colour. Design your own menus or choose between ready-made templates from the list and edit them as you wish. Make use of pre-made innovative DVD menus. Make the most of your multi-core processor power. Multi-core machines supported. Choose from a set of handy and professionally created templates and presets. It is a powerful and complete DVD authoring and burning solution. Qweas is providing links to AVS DVD Authoring 1.3.4.56 as a courtesy, and makes no representations regarding AVS DVD Authoring or any other applications or any information related thereto. Any questions, complaints or claims regarding this application AVS DVD Authoring 1.3.4.56 must be directed to the appropriate software vendor. You may click the publisher link of AVS DVD Authoring on the top of this page to get more details about the vendor.